The world progresses, year by year, century by century, as the members of the younger generation find out what was wrong among the things that their elders said. So you must always be skeptical — always think for yourself. Linus Carl Pauling (February 28 1901 – August 19 1994) was an American quantum chemist and biochemist, a pioneer in the application of quantum mechanics to chemistry, and one of the founders of molecular biology. He received the Nobel Prize in Chemistry in 1954, and the Nobel Peace Prize in 1962; he is the only person in history to receive two unshared Nobel Prizes. Science cannot be stopped. Man will gather knowledge no matter what the consequences – and we cannot predict what they will be. When an old and distinguished person speaks to you, listen to him carefully and with respect — but do not believe him. Never put your trust into anything but your own intellect. Do unto others twenty-five percent better than you expect them to do unto you. A substance showing resonance between two or more valence-bond structures does not contain molecules with the configurations and properties usually associated with these structures. The Nature of Chemical Bond (1939), Ch 14. A Summarizing Discussion of Resonance and Its Significance for Chemistry. Science cannot be stopped. Man will gather knowledge no matter what the consequences – and we cannot predict what they will be. Science will go on — whether we are pessimistic, or are optimistic, as I am. I know that great, interesting, and valuable discoveries can be made and will be made… But I know also that still more interesting discoveries will be made that I have not the imagination to describe — and I am awaiting them, full of curiosity and enthusiasm. Lecture at Yale University, "Chemical Achievement and Hope for the Future." (October 1947) Published in Science in Progress. Sixth Series. Ed. George A. Baitsell. 100-21, (1949). We may, I believe, anticipate that the chemist of the future who is interested in the structure of proteins, nucleic acids, polysaccharides, and other complex substances with high molecular weight will come to rely upon a new structural chemistry, involving precise geometrical relationships among the atoms in the molecules and the rigorous application of the new structural principles, and that great progress will be made, through this technique, in the attack, by chemical methods, on the problems of biology and medicine. Nobel Lecture (11 December 1954). We must not have a Nuclear war. We must begin to solve international disputes by the application of man's power of reason in a way that is worthy of the dignity of man. We must solve them by arbitration, negotiation, and the development of international law, the making of international agreements that will do justice to all nations and to all peoples and will benefit all nations and to all people. Now is the time to start. Debating Edward Teller, in The Nuclear Bomb Tests...Is Fallout Overrated? : Fallout and Disarmament KQED-TV, San Francisco (20 February 1958). The power to destroy the world by the use of nuclear weapons is a power that cannot be used - we cannot accept the idea of such monstrous immorality. The time has now come for morality to take its proper place in the conduct of world affairs; the time has now come for the nations of the world to submit to the just regulation of their conduct by international law. No More War!. New York: Dodd, Mead & Company. 1962. p. 209. The only sane policy for the world is that of abolishing war. Nobel Lecture for The Nobel Peace Prize 1962 (11 December 1963). I realized that more and more I was saying, "It seems to me that we have come to the time war ought to be given up. It no longer makes sense to kill 20 million or 40 million people because of a dispute between two nations who are running things, or decisions made by the people who really are running things. It no longer makes sense. Nobody wins. Nobody benefits from destructive war of this sort and there is all of this human suffering." And Einstein was saying the same thing of course. So that is when we decided — my wife and I — that first, I was pretty effective as a speaker. Second, I better start boning up, studying these other fields so that nobody could stand up and say, "Well, the authorities say such and such "
Interview at Big Sur, California (11 November 1990). I've been asked from time to time, "How does it happen that you have made so many discoveries? Are you smarter than other scientists?" And my answer has been that I am sure that I am not smarter than other scientists. I don't have any precise evaluation of my IQ, but to the extent that psychologists have said that my IQ is about 160, I recognize that there are one hundred thousand or more people in the United States that have IQs higher than that. So I have said that I think I think harder, think more than other people do, than other scientists. That is, for years, almost all of my thinking was about science and scientific problems that I was interested in. As far as women are concerned, I am old-fashioned enough to like the idea of a woman's managing the household. This is an important activity. A woman does not have to be a bank vice-president to find happiness. I should think routine work like sitting at a desk writing letters, making reports, or punching data into computers would be much less interesting and satisfying than running a home. As quoted by Francis Crick in his presentation "The Impact of Linus Pauling on Molecular Biology" (1995). I have always wanted to know as much as possible about the world. Linus Pauling In His Own Words (1995) by Barbara Marinacci ISBN 0684813874. Only when I began studying chemical engineering at Oregon Agricultural College did I realize that I myself might discover something new about the nature of the world. Linus Pauling In His Own Words (1995) by Barbara Marinacci. When an old and distinguished person speaks to you, listen to him carefully and with respect — but do not believe him. Never put your trust into anything but your own intellect. Your elder, no matter whether he has gray hair or has lost his hair, no matter whether he is a Nobel laureate — may be wrong. The world progresses, year by year, century by century, as the members of the younger generation find out what was wrong among the things that their elders said. So you must always be skeptical — always think for yourself. Linus Pauling: Scientist and Peacemaker (2001) by Clifford Mead and Thomas Hager. What astonished me was the very low toxicity of a substance that has such very great physiological power. A little pinch, 5 mg, every day, is enough to keep a person from dying of pellagra, but it is so lacking in toxicity that ten thousand times as much can be taken without harm. Statement about vitamin B3, (either niacin or niacinamide), in How to Live Longer and Feel Better (1986), Avon Books, ISBN 0-380-70289-4 , p. 24. I have something that I call my Golden Rule. It goes something like this: "Do unto others twenty-five percent better than you expect them to do unto you." … The twenty-five percent is for error. Pauling's reply to an audience question about his ethical system, following his lecture circa 1961 at Monterey Peninsula College, in Monterey, California. Linus Pauling In His Own Words (1995) by Barbara Marinacci, p. 29. He combined scientific brilliance, political courage, and a stubborn, quirky single-mindedness in ways that... will probably always resist simple explanation. Jeremy Bernstein, in The New York Review of Books (16 November 1995). Linus Pauling was not always right in his ideas. But my belief is that, in most cases, if somebody is always right in his ideas you find that he does not have much to say. It is an expression of somebody's fertility that he does produce quite a number of ideas, and I think Linus Pauling's score is pretty high... I do not think, as I said earlier, that it is right to discuss the impact of Linus Pauling on molecular biology. Rather, he was one of the founders of molecular biology. It was not that it existed in some way, and he simply made a contribution. He was one of the founders who got the whole discipline going. Francis Crick, "The Impact of Linus Pauling on Molecular Biology" (1995). Whatever the context and whatever the audience, he was clear, he was committed, he was compassionate, and, far more often than most, he was right — or if not, at least on the side of the angels. Derek A. Davenport, The Many Lives of Linus Pauling: A Review of Reviews. Derek A. Davenport. J. Chem. Educ. 1996. 73, A212. 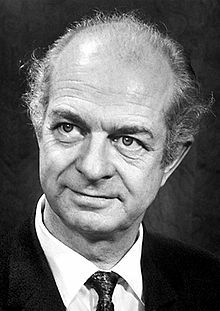 If there is a need for a universal hero, it is easy to see why Linus Pauling would be nominated for the role. In many ways he seemed larger than life. Ted and Ben Goertzel, "Introduction", in Linus Pauling : A Life in Science and Politics. While still in his twenties, he became a world famous scientist... His work in chemical biology , done during the middle years of his life, was almost equally outstanding... Pauling was also acclaimed for his activism as a citizen, although his activities were controversial. He used his scientific credentials to challenge the government's claims that fallout from nuclear testing was not harmful. The right wing of the 1950s denounced Pauling as a Communist, or at the least a fellow traveler. Pauling and his wife were, in fact, openly active in several organizations dominated by Soviet sympathizers, as well as dozens of others. But they were never apologists for the Soviet party line, or any other organizational dogma, nor did Pauling refrain from challenging the Soviets when he thought them wrong. Then, at the peak of his prestige and renown, instead of settling into a comfortable elder statesman role, Pauling shocked his friends and admirers by launching a crusade to prove that vitamin C would cure the common cold... While Pauling quickly recognized his error on DNA, accept­ing it as the kind of mistake any scientist can make and more or less dis­ carding his previous ideas about vitamin treatment of schizophrenia, he never abandoned his claims about vitamin C and the treatment of cancer, and in the last years of his life he felt vindicated when a national medical conference gave him a standing ovation, claiming that "Pauling was right all along." Pauling was not superhuman, but he was a very great man, with an extraordinarily sharp and creative mind, a firm inner determination, and a strong moral sense. His life holds many lessons and poses many intriguing questions for all of us. Pauling scooped out a hollow on the narrow ledge and covered himself with a big map he carried in his pocket. He dared not sleep because of the cold. He counted in French and German and Italian to keep himself awake; he exercised as he lay in his narrow quarters. He told the unheeding ocean about the nature of the chemical bond. When the stars came out, he sighted the end of his walking stick and tried to tell time by the constellations. He recited the periodic table of the elements. He grew more and more anxious, not for himself, since he knew he would eventually be found, but for Ava Helen, whom he could not tell that he was uncomfortable, but unharmed. He was chagrined by his predicament…. Ted and Ben Goertzel, recounting an incident on a cliff at Pauling's ranch, in Linus Pauling : A Life in Science and Politics. Linus Pauling undoubtedly stands as one of the most influential scientists of the twentieth century. Zelek S. Herman, The Chemical Intelligencer (1996). Herman, Z. S., 2(2), 57–58. Quoted in: The Many Lives of Linus Pauling: A Review of Reviews, by Derek A. Davenport. Journal of Chemical Education, Vol. 73, No. 9, September 1996, p. A212. Although Pauling was often controversial and was sometimes criticized in both scientific and political arenas, it is incontrovertible that he had a major impact on science, education, and international peace. Harden M. McConnell, Science (1990) 271, 603–604. Quoted in: The Many Lives of Linus Pauling: A Review of Reviews, by Derek A. Davenport. Journal of Chemical Education, Vol. 73, No. 9, September 1996, p. A212. As my father's son I am certainly among his fondest admirers. Now I have ample evidence that all over the nation, and elsewhere in the world, innumerable people share my affection and admiration in their own ways. They not only admire but love him. They have read his books and articles, have seen him on television, have attended meetings where he spoke, or by chance sat next to him at a banquet or on the airplane. A number have received personal messages from him or talked with him over the phone. They feel a personal connection, a strong bond, with his values-his valiant anti-nuclear-testing stance, his dedication to world peace, his emphasis on vitamin Cas a valuable nutrient for both preven­ tion and treatment of disease, his compassion for the human condition of suffering. For a number of our supporters, Linus Pauling may be the closest embodiment, in this age of uncertainty, amorality, and constant conflict, of a living universal hero. Linus Pauling, Jr., 1993, quoted in Linus Pauling: A Life in Science and Politics by Ted Goertzel and Ben Goertzel with the assistance of Mildred Goertzel, Victor Goertzel. From time to time throughout his long life, scientists and commentators dismissed him as a showman. Would that we had a whole troupe of such scientific showmen. John Allen Paulos, “Pauling’s Prizes”, The New York Times Book Review (5 November 1995). An extraordinary person — a scientist, educator, humanist, and statesman with worldwide impact in each of these roles. John D. Roberts, Chemical & Engineering News (1996), 74(17), 47–49. Quoted in: The Many Lives of Linus Pauling: A Review of Reviews, by Derek A. Davenport. Journal of Chemical Education, Vol. 73, No. 9, September 1996, p. A212. Biography, interview, and further material at the Academy of Achievement.